Not sure if you concur with Socrates in that death may the greatest of all human blessings but it is certainly a topic that is relevant to every mortal and has been explored in a myriad of ways. 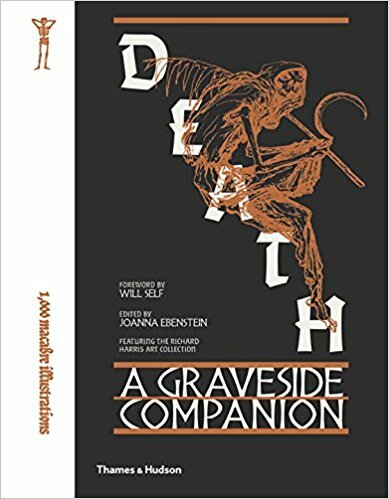 With over one thousand images, Death: A graveside companion is an opulently illustrated tome whose four hundred pages shed light on the intersections between life, beauty, spiritualism, mourning and death and its perception and depiction in different cultural contexts and through the ages. Rituals, celebrations, sacraments, customs are depicted with images mainly based on the collection of one Richard Harris and help to understand that what is perceived to be the common perception of death is merely a one-sided view that helps to deal with a taboo subject that does not discriminate. What can be a morbid and voyeuristic affair, has been resolved by editor Joanna Ebenstein’s dignified approach to mortality, the curation of the depictions and the essays contributed by authors, medical professionals, academics, cultural critics and spiritual luminaries. The essays are often scholarly in nature yet accessible for the uninitiated as well as diverse with the background of the individuals not being rooted in a singular discipline, but presenting a wide range of perspectives. Ebenstein’s approach tackles the sujet from different angles – be it myths, pop culture, metaphysics or science – and thereby creates a stimulating and inspiring source of insights. A beautiful, handsomely bound and superbly edited compendium dealing with the inescapable and capturing attitudes, thoughts, ideas, interpretations, traditions and musings on the biggest mystery there is.